If you’ve ever felt alone in the world, here’s a good reason to book your next flight somewhere (anywhere): When you’re flying at any single moment in time, you’re in the airborne company of a pretty staggering number of people around the globe. Aviation data companies like FlightAware keep track of all (or at least most) of the aircraft in our skies. And according to them, in the past year there were an average of 9,728 planes — carrying 1,270,406 people — in the sky at any given time. That would make the skies the 156th most populous country in the world, right between Estonia and East Timor. Of course, that’s not the same number you can expect to see on every day of the year: The lightest day for air traffic, according to the data, was on the first day of the new year. 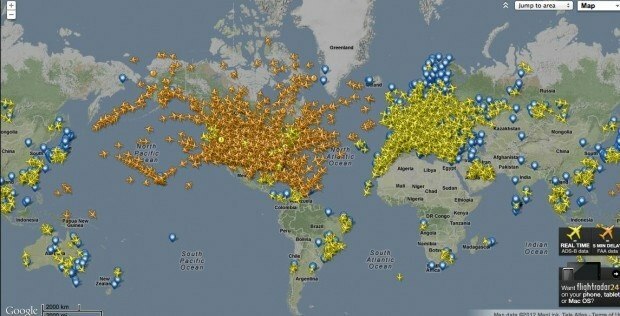 On January 1, 2017, there were just 3,354 planes in the sky at the day’s peak. And the heaviest air traffic day was Aug. 5, 2016, when 12,856 planes carrying 1,590,929 people were sky-bound at the same moment. The question is clearly not a simple one. Despite registration and manufacturing figures, keeping track of every aircraft in the world is not an easy task. According to aviation analysts Ascend, the total number of aircraft currently in service is approximately 23,600 – that includes passenger and cargo aircraft. It reckons there are 2,500 more in storage. The International Civil Aviation Organisation (ICAO), a UN body, says that the “global air transport network” doubles in size at least once every 15 years, and that it’s expected to do so again by 2030. Boeing, one of the world’s biggest aircraft manufacturer, agrees. It says that there is a need for 39,620 new planes over the next 20 years, so by 2037 there should be 63,220 aircraft in the world – minus older ones that slip out of service.